Nearly every year for the past 20 years, we've gone to the Herbal Affair in Sand Springs, Ok, just outside Tulsa. It's a great little community of about 20,000 and each year, they host one of the best herb festivals in America. Back when they began, I was still hosting Herb Day in May here at the farm. Five ladies came from Sand Springs, including Sandi Byerly and Ruth Leib, checking out how I ran my festival and looking for ideas. They saw a couple of things they wanted to use and said they hoped I didn't mind that they were starting a festival around the same time as mine. I didn't, and in fact, I believe that was my last year out of 7 years of hosting Herb Day in May. It was growing too fast, getting too big. Valet parking was always one of the services we provided, not because we were exclusive, but because there was so little room to park, and little level ground, that it was safer and easier to have volunteers park cars for what was back then, mostly a women's attended event. The Sand Springs "city fathers," as the first group of organizers called them, let them have 1/3 of the town triangle for their "little festival." That first year they drew about 3,000 people and it got the city father's attention. The next year the Chamber of Commerce, the mayor, the Boy Scouts and several civic groups and churches got behind them and the festival has continued to grow ever since. I don't think we've missed but one year in the 20 and so it was a pleasure to be asked to speak this year at the 20th anniversary (on "Herbal Home Remedies That Work"). They annual have about 25,000 people for the event, always held the 3rd Saturday in April. This year, with drizzling rain and dark clouds, the attendance was down slightly, but the vendors all seemed to have great sales. I know our sales were only down a tiny bit over last year. 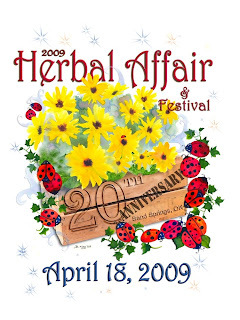 The Herbal Affair is unique because they hold tight to the overall theme of herbs. 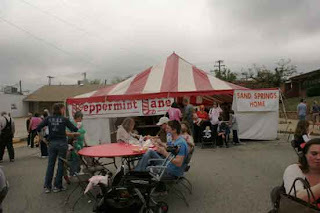 From the Peppermint Lane tent where you can drop off your kids and know they are safe and entertained with games, to the Basil Street Stage which has entertainment all day long. Bluegrass, jazz, country, children's ballet, jig dancing and sometimes Native American traditional dancing, all are held on that stage in the center of it all. And it's a great big family event, no longer just the garden club set. Master Gardeners, young couples who are starting their first garden, kids of all ages, everyone comes to the Herbal Affair. Everything has to be herbal, the food, including a tent of Amish cooks with their chicken and noodles and (my favorite) homemade chicken salad sandwiches and pineapple coconut pie. The Boy Scouts sell root beer out of canoes filled with ice. Mr. Tomato Man sells nothing but heirloom tomatoes (actually it's his daughter now as he's deceased, but people still flock to the booth for their annual heirloom tomatoes, still $2 each). Homemade soaps, with our friend Gayl Bousman of Evening Shade Farm, games, dog sitting, plant sitting, garden antiques, garden art, everything relating to the garden can be found there. It's where I always buy a lot of my herbs for the garden, it's where I've found the garden sculptures we have in the lavender bed and it's like an annual homecoming, seeing friends and customers we only see once a year. It's a great place for buying interesting new plants for everyone. The festival covers not only the downtown city triangle, but goes for several blocks to the nort h and east. They offer free trolley service from the parking lots and to my knowledge, don't charge a fee for entry. Their money comes from booth fees, which are reasonable, table rentals and tax revenus (sales tax in Sand Springs is 9.4%). All of the money goes toward the youth organizations and youth projects for the city. It's also a big day for dogs as half the people seem to bring theirs. 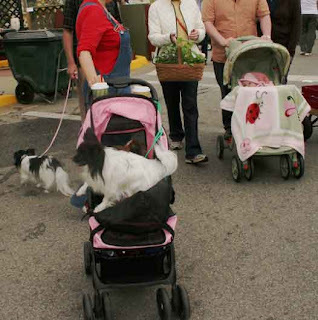 Some in baby carriages, some tucked into their coats, others on leashes, but it's a dog's day out, too. The red buds are still in bloom here! That's a full month of blooming. 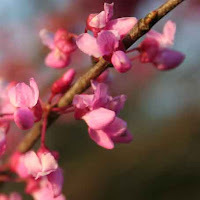 I don't ever remember red buds in bloom this long. We've enjoyed the blooms in salads and now the little "pea pods" will be coming where the blossoms were and we'll have those steamed a time or two before they get too tough. They taste a lot like sugar snap peas, just not as sweet. But think of it, FREE FOOD just growing on trees! We're still having morels, too, in fact, we've eaten them the past 2 nights with our visitors. Paul and Erinna Chen, Josh's niece and husband, and their daughters Pikea, 4, and Vega, 8, are here visiting their Grandmother Barbara, from Rochester, NY. 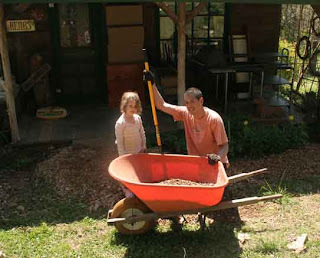 Paul has been great working in the garden, spreading gravel in the pathways and around the Herb Shop porch. He cut the old red bud down, along with trimming another one and cutting down the nearly dead crab apple tree. He likes outdoor work and they have a garden back home. The children have enjoyed gathering eggs, watching the new goat kids bounce off of things and just generally enjoying the farm. I'm waiting for the ground to dry a bit more so I can get the asparagus bed finished, and the asparagus planted. It's heeled in, in another bed temporarily. With a little rock work and some mortar in the joints, it will be a working raised bed again. 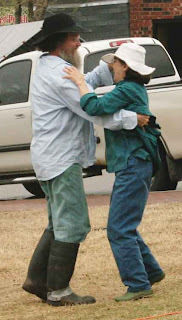 I'm off to Otis, Indiana, near Michigan City, to speak at the LaPorte Master Gardeners conference this coming weekend. It will be interesting to go north, up near the Great Lakes, where spring hasn't quite awakened yet. Maybe that's why we're hearing loons here in the mornings. I often hear their call when I'm in the hot tub. The loons have moved south, to get at spring a few weeks earlier. I'm betting that morels, red buds, dogwoods and other spring plants aren't in season yet up north. It will be interesting to see and reminds me of a fantasy I've had over the years, of starting as far south as morel mushrooms grow, and following spring northward with the morel season. Wouldn't that be fun? There are some specific things I look forward to each year. Baked turkey at Christmas; lilacs in bloom in April; the first tomato, the first sweet corn, the first dogwood to bloom, and....morel mushrooms. They are without a doubt, a world class delicacy, up there with truffles, the best Italian cheese, a fine wine and birthday cake when you're 4 years old. If you have grown up with morels, you know never to ask someone where they found theirs. You know, too, that when someone asks you to hunt with you, or for you to show them where to hunt, as lots of readers did some years back when Gourmet magazine came to the farm to write an article about one of my meals, which included morels, then you know that person doesn't have a clue. One never shares their morel hunting grounds, not until just before they're ready for that last great morel hunt in the sky. Those secret morel hunting places are guarded and passed down from generation to generation. "Where'd ya find your morels?" is a phrase only spoken by an outlander, an outsider, someone who just doesn't have understand the secrecy and mystery involved in morel hunting. 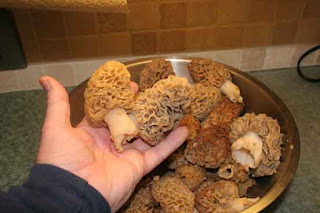 Josh spent early Easter morning out in the pouring rain, in the woods, hunting over one of his favorite morel grounds and came back home with a big ole bag full of morels including some fairly large ones. And, knowing full well, I will be battling gout by tomorrow as penance for my eating, I fixed a batch and indulged myself for tonight's supper. Two things will give me gout with near absolute certainty: a plateful of morel mushrooms, or biscuits and gravy (gout is from the build up of uric acid and relates to kidney function). So I have my prednisone at hand for the middle of the night when my foot will likely feel an elephant stomped on it, but for this eveing, I et a mess o' morels and enjoyed every last crumb. 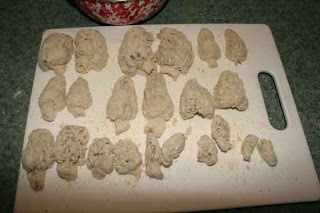 My recipe for cooking morels is my own concoction and it works for freezing morels as well as cooking them. 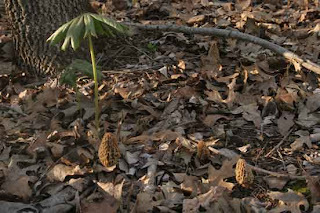 People who've tasted it, including those fine folks from Gourmet magazine, say it's the best tasting morels they've eaten. I don't fry many things, but morels are best fried to a golden brown, crispy state and eaten immediately. First split the mushrooms in half and soak in salt water if you need to, to chase out any ants. Drain. Get a little bowl of buttermilk ready. And put a sleeve of saltine crackers in the food processor and process to fine crumbs, then pour those into a zipper baggie. 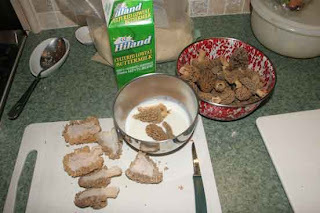 Drop the morels into the buttermilk, then drop into the baggie of cracker crumbs and shake to completely coat the mushrooms. Lay them out on a cutting board. (At this point you could lay them on a cookie sheet and put them in the freezer for overnight, then bag up in zip bags. 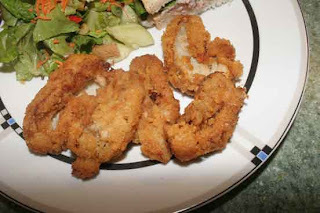 They're just like fresh for about 3 months in the freezer and can be taken out and immediately fried). 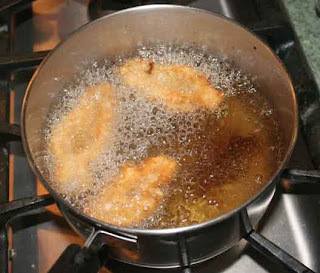 Heat a pan of cooking oil to hot (peanut or canola oil works best for this; olive oil doesn't do well heated that hot. The oil needs to be hot, not smoking, just good and hot, about 360 degrees. Hot enough that when you drop the mushrooms in, they sizzle and simmer, not losing the breading, but not cooking so fast they burn, either. Drop the mushrooms in, 3 or 4 at a time. It should take about 2 minutes to cook the mushrooms, turning once. Drain and keep hot and cook up the rest. Sometimes I dust the mushrooms with crumbled dried dillweed, but usually, just a tiny salting is all they get. They're crispy on the outside, so tender and sweet on the inside and there just aren't many foods as good. Nothing whatsoever, in the springtime, looks like a morel mushroom, either. 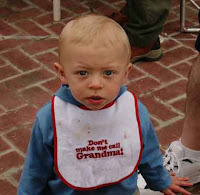 Or tastes as good. I was out photographing some of our plants this week. First, the pawpaws are in bloom. If you look at the photo of the flower, notice in the upper right hand corner, the pollinator is waiting for me to finish interrupting so he can complete his visit to the flowers. Pawpaw's flowers don't have a lot of smell, but to a fly or some wasps, they evidently do. In the fall, where those flowers were, will be a 6 or 8 ounce green potato-looking pawpaw fruit that will taste like a combination of vanilla pudding and banana. That's probably why they're called Ozarks bananas (or Indiana bananas, depending on where you are at the time). Pawpaws normally grow in the shade in deep woods, in moist valleys and draws between the hills but when I was a kid, my grandmother, who lived in Nevada, MO, in West-Central Missouri, had a next door neighbor with a pawpaw tree in her front yard. It was in full sun and looked a lot like a magnolia tree in shape and leaf size. She had no interest in the fruit so my Grandma and I would go pick pawpaws from under the tree in the fall of the year. Also in bloom is the wild ginger (Asarum canadense). 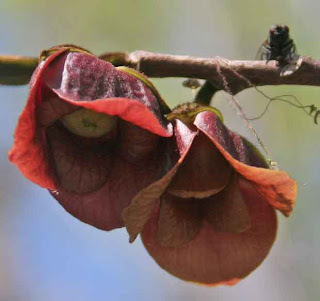 I'd thought the flowers look an awfully lot like pawpaw blossoms but up close, they don't at all. 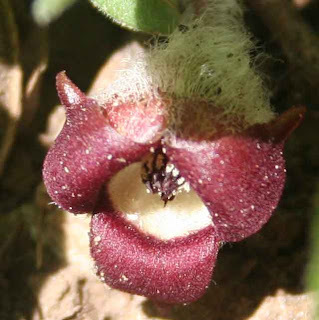 Just a similar colo r. I like to go digging wild ginger right before Christmas and clean the roots, then candy them. Wild ginger isn't as hot as Asian ginger but has the same fresh, pleasant gingery taste. All the dire warnings about frigid temperatures for last night, and probable death to the newly pollinated fruit on the trees and such, the severe cold didn't come to pass. Being near the lake moderates our temperatures often, and it helped last night. It got down to freezing, but not below (18-20 degrees was predicted). But death did come. Yesterday I took this photo of Allium's triplets, born two days before and they all appeared well. Allium accepted them all without hesitation, and all were seen nursing. But this morning Josh found the dark colored one (on the right), nearly dead. Evidently the male of the trio, the more aggressive one, had been pushing her away and she wasn't getting enough milk. During the night she was just too weak and was cold this morning. Josh brought her inside to warm her and got some milk down her, but being so weak and so young, she didn't survive. 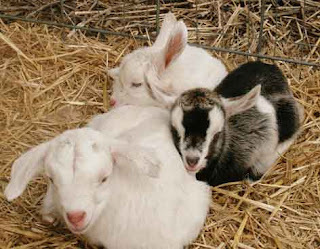 Now Allium is left with one little female and one male kid. It's sad but it's life on the farm. We've had 7 new kids born in less than a week and one nanny still expecting. The trilliums are beginning to bloom in the garden and in the woods, too. I saw some in the woods last week with white blossoms (Trillium pusillum var. ozarkanum), also known as "wake robins," but mine in the garden is the purple trillium (Trillium recurvatum). 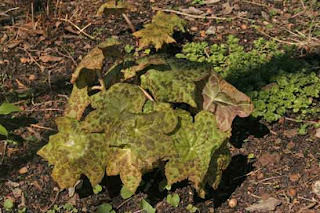 You'll find them growing in the woods along with dog tooth violets (Erythronium albidum) and may apples (Podophyllum pelatum). 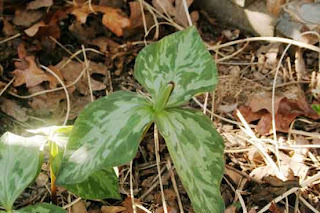 American Indians used trillium, which was also known as "birth root," for treating menstrual disorders and Iroquois women reportedly ate the leaves of trout lily to prevent conception, both according to the Peterson Field Guide to Medicinal Plants. Most people now just look upon these early spring plants as interesting to grow. I made my annual trek into Arkansas to rake up pine needles for the herb beds. 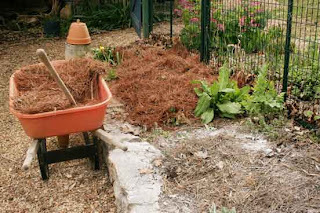 Pine needles provide enough mulch to keep weeds at bay and yet don't hold excess moisture like straw or wood mulch does. 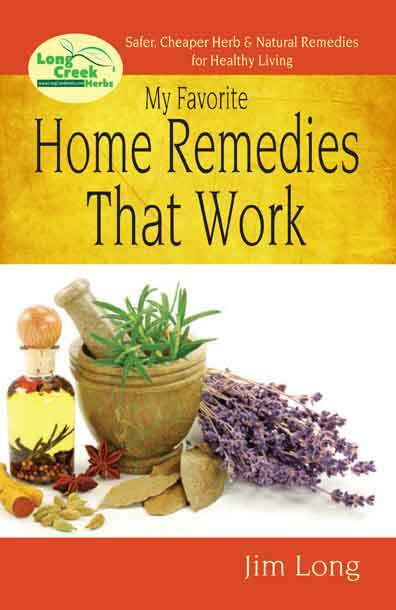 Herbs don't need much moisture on their roots and too much even gives problems on some herbs. Every year I give all the herb beds a good dusting of lime, then lay down several inches of pine needles. They only last one season, but it's the best mulch I've found for herbs. You can also buy baled pine straw from agricultural supply stores, in small bales like you see here. 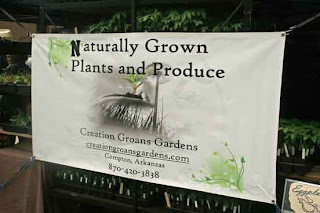 Part of my annual pilgrimage into the wilds of Arkansas, besides getting pine needles, is stopping at Perennials, Etc. in Garfield, AR. Steve & Susan Davisson always have interesting and unusual plants. Susan showed me this unusual Japanese may apple that is growing in her woodland garden near the nursery. Unlike our native may apples, which bloom white, this one has red blossoms and spotted leaves. Very unusual and it almost looks mossy. I wonder what the apples taste like? May apple jelly is an old time favorite for Ozarks families. Also while at Perennials, Etc. I spotted this pair of carrots and decided they would do well at Long Creek Herb Farm. 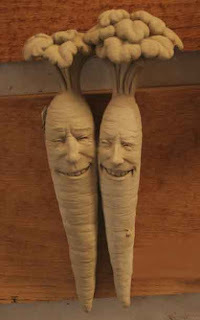 I think the artist dubbed the pair, "Bunny Bait," but I'm just calling them the Carrot Pair. Steve had attached these giant lips, nose and eyes to the tree growing beside the Japanese may apple. 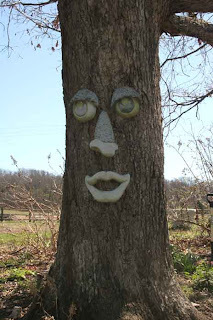 It's good to know other people see faces in trees, besides me. Due to the amount of spam, and the lack of comments on my blog posts, I have disabled the comments button. If you have questions or comments, you are welcome to email me through my website, listed elsewhere on the blog page. I'm always happy to have comments from readers and followers.